I think it’s beautiful when people use Tarot to heal themselves and to tap into their inner wisdom. Holly Whitaker, founder of Hip Sobriety and co-host of the HOME podcast, is a great example of that. Whether you’re on a healing journey yourself, or you’re simply seeking to connect more deeply with your intuition, I think you’re going to really love today’s conversation. It truly resonated with me, and I loved hearing how Holly has been able to take the healing power of the Tarot cards and bring it into her daily practice in a beautiful way. 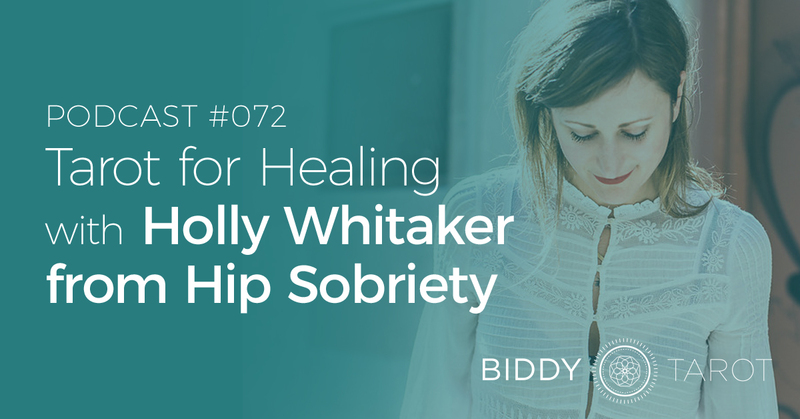 You’re listening to the Biddy Tarot Podcast, and this is Episode 72: Tarot for Healing with Holly Whitaker from Hip Sobriety. Welcome to the Biddy Tarot Podcast, where you’ll learn how to connect more deeply with your intuition and live an empowered and enlightened life with the Tarot cards as your guide. Listen as Brigit and her guests share their very best tips and strategies to help you read Tarot with confidence. Now, here is your host, Brigit Esselmont. BRIGIT: Hello, and welcome back to the Biddy Tarot Podcast. As always, I love talking with you about Tarot. Now, on today’s podcast, I am super excited to speak with Holly Whitaker, who is the founder of Hip Sobriety. In October 2012, Holly was in a dark place. She was addicted to alcohol, had an eating disorder, and was sending herself to an early grave. She started to seek out rehab options, like Alcoholics Anonymous, but she really struggled to find a recovery method that resonated with her, so she created her own path – and one that was more holistic and embracing of the way that she wanted to live, rather than one that was focused on creating guilt around the path that she had previously chosen. Now, fast forward to now, and Holly has been sober for almost five years and is now inspiring others to do the same with her business, Hip Sobriety. She is a fierce advocate for using spiritual tools to aid in recovery, and she teaches those techniques as part of her program Hip Sobriety School, and she also talks about them on her HOME podcast that she co-hosts with Laura McKowen. In this episode, we hear about Holly’s journey, how she learnt to listen to her inner voice and really tune into her inner wisdom using Tarot cards as a guide. Whether you’re on a healing journey yourself, or you’re simply seeking to connect more deeply with your intuition, I think you’re going to really love today’s conversation. It truly resonated with me, and I loved hearing how Holly has been able to take the healing power of the Tarot cards and bring it into her daily practice in a beautiful way. Let’s get into it. BRIGIT: Welcome, Holly! I am so excited to have you here on the podcast. How are you doing today? HOLLY: I’m doing really well. I’m pretty tired. I went from California to Texas after actually travelling all week long, so I’m tired but really good. I’m really excited to have this conversation. BRIGIT: Likewise. Tell me a little bit about yourself and your journey. You’ve been on a big journey. BRIGIT: So, I would love to hear from that personal perspective and what that has blossomed into, particularly with Hip Sobriety, as well. HOLLY: That’s such a loaded question. The long story short is I got sober, and I started working towards sobriety in October 2012. At the time, I was a Director of Revenue Cycle Management Operations at a healthcare start-up in San Francisco, California. I didn’t have much of a spiritual life. I was raised Christian, but I didn’t have much of a spiritual life. In my early thirties, I had a very urban life. I was pretty focused on climbing up the corporate ladder… and then I got sober. A series of events unfolded that were really profoundly miraculous. Once you really start to open yourself up to a different way of living and to asking for guidance and all the stuff that supports us and really start looking for it and asking for it, it’s just amazing what can unfold. It’s a really long story, so just to keep it short, I hit a point in October 2012. I had an eating disorder. I was addicted to alcohol and cigarettes and pot and used recreational drugs, and then I was dying and hit a point where I couldn’t do it anymore and asked for help, and help came in really fast, and then I stopped drinking. From there, I eventually healed from the eating disorder. I stopped smoking pot and doing all recreational drugs and got completely sober. I stopped smoking cigarettes. I was really influenced by what Gabby Bernstein was doing and wanted to do something like she was doing but in the sobriety world. I started it in October 2012, and I left my job in March of 2014 and started my own business three years ago. Now I do that thing that I saw from afar when I was still pretty sick. Yeah, it’s not even recognisable from what it was to how it is today. HOLLY: In the best possible way. BRIGIT: Tell me a little bit more about Hip Sobriety. What is your driver, your motivation? Who are you here to serve? How does this all come into play for you? HOLLY: Well, myself, four years ago, I was working at the time in a healthcare start-up that was really trying to take the clinical feel out of going to the doctor’s office and trying to reinvent what that experience is. In America, I’m sure you know the healthcare system is just a mess, and most people associate going to the doctor with one of the worst experiences they can have, like going to the Department of Motor Vehicles. I was working on creating this profoundly different experience and fixing the healthcare system by targeting the patients and giving them an inviting and healing experience, instead of something that can tend to work against their wellbeing, and here I was experiencing a health crisis. My whole life was dedicated to fixing healthcare. This was my mission, and the healthcare system had no recovery program for me that I could afford, that my insurance card covered, and then there’s AA, and that was just not appealing to me. When I started looking for resources and an appealing and desirable path that felt like it was… A lot of people don’t want to be in a problematic relationship. They don’t want to be addicted to drugs or alcohol, but then what they see as the alternative to that is something they want even less, and that was true for me. I didn’t want to be where I was, but the alternative was definitely something I didn’t want either. I started to create the thing that I felt would allow for what the healthcare system was missing: accessible recovery. Meaning giving people access to what works, and not just saying only one thing works, as we’ve done for so long, which is AA, but saying many things work, and you need holistic recovery. And then I also added this other flair to it, which was making it desirable, giving people this empowered and beautiful experience, as opposed to looking at it as more of a privilege and the path to waking up, versus a consequence for “bad behaviour,” as we treat it. We really have punitive treatments for addiction in America and everywhere in Western civilisation where we have addiction, but in America specifically, the War on Drugs started here, and it spread. We treat people that are sick as criminals and failures. What was out there when I started looking really reflected that. It was the last place I wanted to end up, and what I found is it’s the best thing that’s ever happened to me, so that’s what my work is really founded in – this idea of presenting that. BRIGIT: Wonderful. Interesting. It’s more of a holistic approach to sobriety and managing that addiction – would that be fair? HOLLY: Yeah, it’s a holistic approach, and it’s a really desirable holistic approach. It’s really playing up what you get, not what you’re losing, and the freedom that comes with it, and it’s a complement. People can use it working various programs. It’s just kind of saying there is no one right way, and it’s really up to the individual to understand what works for them, versus society deciding that this one thing has to work for you, and if it doesn’t, then there’s something wrong with you. It’s a very different approach than what we’ve been conditioned to take as an approach. BRIGIT: Yes, and now to a much more fluid and flexible thing. BRIGIT: I see the same happening in Tarot. We’ve come through a place where it can be very much like “You must read the card in this certain way,” and now we’re expanding into something that’s a lot more flexible and embracing, which is cool. BRIGIT: Tell me a little bit more about how Tarot has played a role in your healing journey. I’m so excited to hear about this because we love hearing how Tarot gets used in a more practical way. Please share how it has come into your journey. HOLLY: Yeah, I think part of it is I found it the first time I was in Italy. I also spent the last four years travelling extensively to Italy. Rome and Sicily are my two favourite places, and my first Tarot deck I got when I was in Sicily with one of my friends the first time that I was there. It’s a great story because he was a huge part of my life, and he found it, and he was an engineer. He would never, ever be into Tarot cards, and he found them in the back of this store in Sicily, and he was like, “I think you would really love this.” I went and got… Oh my gosh, I can’t even think of the name… The Winged Spirit Tarot deck, and just got back to our apartment that night in Sicily and spent… There is a picture of him actually coming out and telling me to go to bed because I stayed up all night, reading Tarot and learning to read Tarot. The way that I’ve used them… In my recovery, I’ve used everything from naturopaths to medical doctors to massage therapists. I’ve used psychotherapists and somatic experiencing. I’ve used all these different things. Acupuncture! I also have used a psychic, and I also have used card readers, and I also have an astrologist who does my chart. This is just another facet of it. Really, the thing that I’ve gotten the most out of it is learning to use your intuition. For me, I’ve used books, and I’ve used the guides, and I interpret the cards literally, but the best thing about learning to read Tarot has been learning to trust my instinct and not trying to find some magic in a card spread, but more than anything, actually knowing that all it is is a reflection of what’s inside of me and what I already know. This is an important part of this because when we are on the path of recovery from addiction, a lot of times, we’re sold this lie that we can’t trust ourselves, that our ego is talking for us, that we can’t trust our gut sense or our intuition, that our intuition is wrong. A lot of times, again, we talk about this patriarchal and hierarchical… There is the idea that society knows, or others know, what’s better for you than what you know because you’ve made all these terrible decisions, and you’ve gotten yourself to this point. For me, the first place I really started to trust that gut sense was just when I started to pick a card out of a Tarot deck and allow my intuition, letting my fingers go over a card and go, “Is it this one? No, I don’t want that one.” Going through, as I’m shuffling, and when I’m ready to stop… Sometimes I would shuffle for 30 minutes because I wasn’t ready, and then I would get the hit, and I would be like, “OK, now!” and sometimes it comes immediately. For me, it’s helped me to make decisions and understand situations, but one of the best things it’s done is allow me to use my intuition, that there is something inside of me that’s a lot smarter than my brain. BRIGIT: Yeah. I think you’ve really nailed it. I was getting chills as you were speaking. I really resonate with what you’re saying because I think, on the surface, we’re reading Tarot cards, right? BRIGIT: But what’s really happening is we’re using these cards, and we’re accessing our intuition. We’re learning how to start, as you said, listen and trust that wisdom, and that’s the actual really valuable process that’s happening. The cards are almost the simple doorway because I think our human brains need something (well, many of us) physical and tangible in front of us to see, and then that’s the access point into what’s happening underneath. BRIGIT: It’s really interesting then to marry that up with perhaps this journey of healing and stepping into sobriety because I suspect you’ve shut down your intuition for so long, and you haven’t been listening to that inner voice of wisdom, and yet when you do… And maybe this is the thing with AA. I don’t know. I know AA is all around finding God, right? It’s got quite a religious connection, right? BRIGIT: I guess it’s similar, but instead of it being a religious thing, it’s a spiritual thing, and we’re finding that voice of inner wisdom inside of us. HOLLY: It’s interesting because that voice… It’s so funny because I think that voice is the thing that eventually wins out. When you hear people’s stories, a lot of people’s stories in recovery, you hear… And one of the things that most often gets the most hits if I post something about it, or if my friend Laura posts (She’s also a blogger in this space, and I do a podcast with her)… We’ve posted things before about the voice, the thing inside of you that is screaming to do something else, and I had this thing inside of me, screaming to do something else for so long. We go against it. We don’t listen to it. We don’t trust it. We think it’s frivolous. We also think it’s irresponsible to listen to something like that. Usually, that voice says, “Quit your job. Get out of this relationship. Go on a crazy trip.” It’s usually not saying, “Put more money in your 401K, and build your retirement plan, and be safe!” but we really turn away from this internal guidance system that we have. For me, this is what that whole process has been, learning to trust myself again, and I need to trust that thing within myself. I would say it’s probably the place where I’ve applied it the most and used it in the most applicable way, if that makes sense. BRIGIT: Yeah. I think once you’re in that space of fully trusting, how can anything negative or dark come into that? How can anything that will not serve you be part of that picture if you’re in full alignment with your inner voice? It’s fab. HOLLY: Even if it seems awful, it’s so true. HOLLY: It’s so funny you say that because I’ve just been thinking about that so much today, that piece there that everything around us is for us. It’s all for us, even though it feels like it’s against us sometimes. BRIGIT: Absolutely. I wonder if you can recall any particular experience with the Tarot, maybe when you were doing a reading for yourself or even having had your cards read for you, that was a pivotal point along your healing journey. Maybe there was a particular card or message. I mean, I quit my job with absolutely zero clue of what I was going to do. I started this company with really zero clue of how I was going to do it and how I was going to make things work. It’s so funny, looking back. The Fool is this thing that consistently came up in my spreads, which is, of course, just this idiot that’s walking out into the void. “I’m going to go and do this thing without any plan.” For me, it was always this idea of stepping off a cliff and then finding the net catching me. It doesn’t come up anymore. It doesn’t ever come up anymore! For a while, the Fool and the Tower – all the structure is coming undone. All these things, when I first started reading, came up again and again and again. The other funny thing too is when I first started doing it, I was just always looking for this obvious thing. I would sit down with the deck. I would say, “Tell me what’s going to happen with Justin,” or “Tell me what’s going to happen with this situation.” I would read it, and I would be like, “That’s not what I want to hear!” A lot of times, you can be like, “Yeah, I can see how this tells a story of what’s going on with me right now.” But the funny thing is, in retrospect, the cards came up regardless of the question I was asking. “You’re an idiot that’s running out into the wild, and it’s working out for you, and also things are falling apart, and let them fall apart, so they can be built again.” Yeah, I think those are two prominent things. I read cards for my friends for a while, and I just had some crazy stuff come up. One of my girlfriends, we did this spread about an ex-boyfriend of hers she hadn’t seen for ten years and had seen that day, and she had a picture of him in her phone that he had just sent to her. The card I pulled was Two of Pentacles. In the deck I had, it was an angel holding two orange balls, and the picture she shows me of this guy is him standing in a bowling alley, holding two of the exact same colour bowling balls. She hadn’t asked about him specifically, but that’s what she wanted to know about. She was married; he was an ex-boyfriend. They had just seen each other for the first time in ten years. She was questioning everything, and she was asking about him but without verbally asking about him, and then that’s what comes up, and she shows me. She pulls open her phone, and she says, “I’ve got to tell you: This is what I was really wanting to know about.” It’s crazy – it’s almost identical, the two pictures of them. Stuff like that happens a lot. For me, whenever I see stuff like that, I just always think it just means we’re on the right path. I always think it’s like déjà vu on some level. I don’t need to read much more into it, other than to know I’m going in the right direction, and this is just a validation of where I’m supposed to be. BRIGIT: Yep, that’s awesome. I love that story! That’s cool. HOLLY: It was so crazy! I’ll send you the picture after because we took a picture of the card and his picture next to it because it was just so mind blowing. Anyways, I love it. I use it as a tool if I just need a little bit more than I have in a moment because I’m a pretty trusting person. I’m a pretty spiritual person, and I really believe I’m being guided in everything I do. The way that I used it in the beginning, just this really hungry, hungry student just wanting to know, wanting to dive into the space beyond what I could see. Now it’s more for just checking in, coming home. BRIGIT: Coming home. That’s neat. At this point, are you only reading for yourself, or are you using cards for others as well? HOLLY: Yes. I will on my friends’ birthdays, or I’ll occasionally take my cards somewhere and read for friends, but I really do it for myself. Just another tool in my toolbox. BRIGIT: Yeah, absolutely. We’ve talked about how you’ve been using Tarot along this healing journey, and particularly to help you through the journey of reaching sobriety. Do you have any tips that you would share with others who might be back where you were in, say, 2012, or even just along those first few steps? What advice would you give to those people? HOLLY: On how to get sober or on how to use Tarot? HOLLY: I always say, “Get a meditation practice going, and start to get into your physical body.” I always recommend reading Allen Carr’s book. I have very specific things. My blog is full of that. My blog has got plenty of tools, but for this, I’d like to say something that’s a little different than what I normally say, which is the most rewarding part of this process is really waking up to myself. A lot of us just sleepwalk through our lives and deny the things within us because we think they’re too frivolous, or we think it’s too dangerous, or there’s too much to lose. A lot of us keep stuck in this really small, tight space, this prison of our own making, and we don’t really allow ourselves to step outside of it. My degree was in accounting. I was a director in the finance department at a healthcare company, and my world had lost most of its magic. I think that when we’re talking about the work that we do on getting sober. Getting sober is escaping. It’s because we’ve forgotten the magic of our life and of who we are and what we’re here to do. It’s just so much grander than we can even begin to imagine. I would just say, if anything, just keep pulling the thread and listening to the magic and letting it, not denying it when your friend comes over, and you pull a card, and it’s the same picture of her boyfriend, that that’s not something. Or when you ask for guidance and help, and it shows up in this weird way, stop trying to refute the stuff that’s around you. Start looking for the magic. One of the things I talk about in my school is the root word of “miracle” is “mirari,” which just means “to behold with rapt attention.” There’s stuff that’s happening around us all the time; it’s just a matter of us really learning to pay attention, and Tarot is just a great way to really pay attention to what’s happening right now, which is more fantastic than we usually allow ourselves to believe. BRIGIT: Yeah, absolutely. I love it. So many people are in denial of that inner voice, and for what reason? I’ve got no idea! HOLLY: If everybody listened to that inner voice, we wouldn’t have wars. HOLLY: If people started to find the power and the magic within themselves, we wouldn’t be in the situation we’re in in this world today. I’m with my mom, and we’re on a trip, and my mom is a political activist, and my sister is as well, and at first, with everything that’s happening in America, I got really into the political scene, and I had to come back to this place. I’ve been going to a lot of yoga classes and listening to my teachers saying my activism isn’t helping people get sober because that is the cure to this. The cure to this is to help people find this magic within them and to really remind humans, one at a time, why we’re here and what our potential is so that we do go and create wars when we forget. It’s true – it’s the most powerful thing, just to remember that. This stuff is important. It’s been tapping into that part of us that knows… You know, it saved my life! BRIGIT: Yeah, absolutely. Awesome. I love it! Tell me, Holly, where can people find out a little bit more about you? And you mentioned your podcast, so please let us know where to find you. HOLLY: My website is HipSobriety.com. The name of my company is Hip Sobriety. I blog, and I write on that website. I also provide a lot of resources to help people start to figure out how to recover, and I run a school called Hip Sobriety School three times a year. It’s an eight-week program, and people can find more about that at TheHipSobrietyProject.com, and then I run a podcast with my girlfriend Laura called HOME podcast, and that can be found at HOMEpodcast.org. It’s a podcast that’s dedicated to talking about all the different aspects of recovery. BRIGIT: Awesome, and we’ll make sure that we post all of those links in our show notes, which you will find at BiddyTarot.com/72. Holly, I’ve really enjoyed today’s conversation. BRIGIT: It’s just been in a lot of alignment and resonance, and I’m that for our listeners, whether they’re on a recovery path, or just a simple living path, I think there has just been so much in today’s conversation that will resonate with so many different people on so many different levels as well, so I really appreciate it. HOLLY: Thank you so much. It’s been a total pleasure. I loved talking to you about this. BRIGIT: Awesome. Bye for now. There you have it. I hope you enjoyed this conversation as much as I did – truly a very inspiring story from Holly. Again, I love seeing how Tarot is used in really powerful ways. I think we got into that beautiful deep space around listening to your intuition and learning how to trust your inner wisdom. That’s what it’s all about, right? That’s what we’re doing more of as we use the Tarot cards as well. Well, I hope you have a wonderful, wonderful week ahead, and I can’t wait to chat with you again next week. Bye for now!